The Marsi (or Marruvii, or Marrubii as used by Virgil) were a group of Italics who, during the Iron Age, were located in central Italy, around Lake Fucino (a region known today as Marsica). They were neighboured to the west by the Latins and Romans, to the north by the Etruscans and Sabini, to the east by the Vestini and Paeligni, and to the south by the Volsci and the Carracini clan of the Samnites. Not be confused with the later Germanic tribe of the Marsi, this Marsi people were part of the Oscan-Umbrian group, largely accepted as being Indo-Europeans (perhaps proto-Celts) who migrated into the peninsula from the north. They were a warlike Italic people who settled in the region of Lake Fucino (modern Marsica), in territory that was centred on Marruvium (now called San Benedetto dei Marsi). The ancient stream called the Pitonius was nearby (now known as Giovenco). The Marsi were a tough, enduring mountain folk whose chief divinity was Angitia, an ancient snake goddess, with snakes forming a symbol of wisdom throughout their culture. Strabo and Pliny, along with other ancient writers, state that the Marrucini, Marsi, Picentes, Sabini, Samnites, and Vestini were originally a tribe of the Sabellians, a collective of central Italian tribes during the early Iron Age. 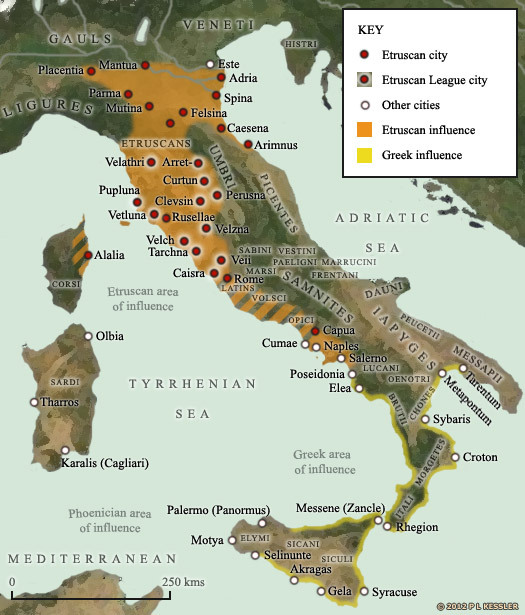 Their language came from the Oscan-Umbrian group of Indo-European languages (P-Italic), which were widely spoken in Iron Age central and southern Italy before the rise to dominance of Latin (Latin itself was a slightly more distantly related language, coming from the Indo-European Latino-Faliscan group, or Q-Italic). Their inscriptions are dated by the style of writing used to the period 300-150 BC, before they were subsumed by Roman culture. Although it is hard to be sure that the Marsi even exist as a separately identifiable people at this stage, they are accounted as subjects of the Etruscans and remain so for a little over two hundred years. Their chief settlement emerges at Marruvium (modern San Benedetto dei Marsi). 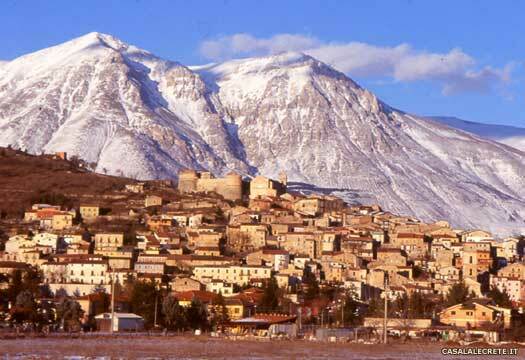 The town is located on the eastern shore of Lake Fucinus (Lake Fucino, which is drained in the nineteenth century AD). Other key settlements include Lecce (modern Lecce nei Marsi), Ortona (modern Ortona dei Marsi), and Trasacco. The Lucus Angitiae, a wood known as the 'sacred grove of Angitia', is a site held sacred by the Marsi for their goddess of that name, close to the later Roman town of Luco (modern Luco dei Marsi). The Marsi still cannot be identified with certainty as a separate people, so they are possibly still part of the Sabellian collective. Around this time they become subjects of the Samnites, fellow Sabellians who dominate a large region of central southern Italy. The Marsi ally themselves with the Romans as a means of removing Samnite mastery over them, while the Dauni, Iapyges, Lucani, Messapii, and Peucetii side with the Samnites at the start of the Second Samnite War. It is in this period that the Marsi are first documented historically, when they are recorded as being confederates of the Marrucini, Paeligni and Vestini tribes. Towards the end of the war, relations with Rome become strained, so the Marsi revolt and realign themselves to the Samnites. Rome consolidates its hold over the central Apennines by founding colonies at Sora and Alba Fucens (on the Aequi frontier with the Marsi) in 303 BC, and at Carseoli in 298 BC (modern Carsoli). A short-lived revolt by the Marsi in 302 BC results in the loss of some of their territory to Rome. The Second Punic War starts at Saguntum (near modern Valencia) in Hispania. Hannibal Barca attacks Roman territory, leading his armies over the Alps into Italy. While encouraging the reluctant Romans to commit to battle, he marches through the country devastating the territory of Rome's Italic allies, including that of the Marrucini, Marsi, and Paeligni. Despite winning the anticipated battle at Cannae, Hannibal is eventually defeated by Scipio Africanus at the Battle of Zama in 202 BC, ending the war. Along with the Etruscans, Iapyges, Lucani, Marrucini, Paeligni, Picentes, Samnites, and Vestini, the Marsi fight the Social War (Italian War, or Marsic War) against Rome during which the Marsi warriors are regarded as some of the best of Rome's opponents. The war is the result of increasing inequality in Roman land ownership, and the spark for conflict is delivered by the assassination of the reforming Marcus Livius Drusus, whose efforts would have led to citizenship for all of Rome's allies. Marsi leader during the Social War. Killed in battle. Marsi commander under Poppaedius. Killed. The Romans take direct control of the Marsi region. Its people are granted Roman citizenship soon afterwards (the withholding of this being one of their main causes of complaint before the war). They retain their identity well into the Roman empire period, during which their chief town, Marruvium, flourishes under the name Civitas Marsorum. Following the Lombard invasion of Italy in the sixth century AD, the Marsi territory becomes a county that is subject to the authority of the duchy of Spoleto in the south. It eventually becomes a duchy in its own right. Marsi, located in central Italy, and former home to the Marsi tribal people, became a duchy for a branch of the Italian noble family of Colonna in the fifteenth century, although it was short-lived. It also served as the seat of an episcopal see. The main town in the region was known as Civitas Marsicana by the Middle Ages, which had originally been founded as the chief settlement of the Marsi. This was destroyed in 1340 when the Angevin Normans were fighting for control of Naples, and had to be rebuilt. Lord of Cave and count of Alba. Lorenzo's domains are divided between his six children, with Odoardo gaining Marsi. Son. Former count of Alba and Celano. Son. Imprisoned. No male heir. Prospero is imprisoned in Civita Lavinia. Both his offspring are daughters so ownership of the duchy passes away from the Colonnas, and in 1540 the episcopal see moves to nearby Pescina. In the seventeenth century, the archbishop of Amasia (from 1643) and patriarch of Jerusalem (from 1638), Don Carlo, is termed the duke of Marsi. He is able to trace his origins back to Lorenzo Onofrio Colonna, albeit via a different branch of the family.